Classic St. Patrick’s Day fare gets a foodie makeover! 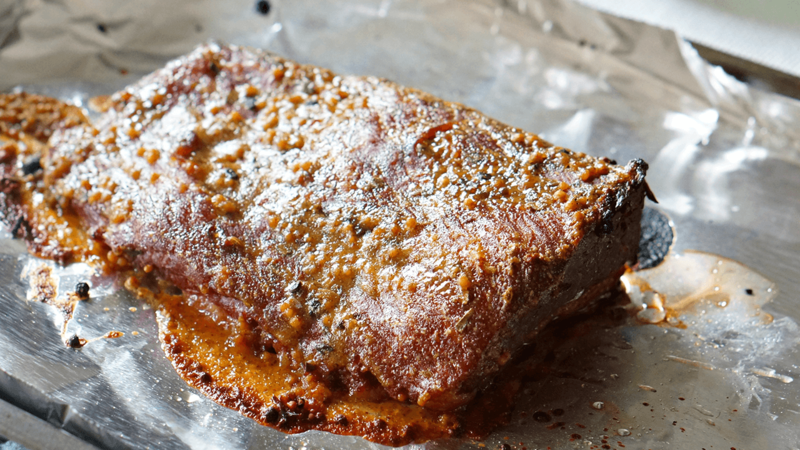 This corned beef recipe, from Forks and Folly, comes out tender from the Instant Pot and gets a seared crust after a spin under the broiler. This recipe is easily adapted for the slow cooker. I’ve been cooking brisket for years during the winter holidays, but it wasn’t until I saw the Rancher Corned Beef Brisket on sale at Harris Teeter that I realized I needed to update my St. Patty’s Day corned beef recipe. After receiving my Instant Pot from the hubs for Christmas, I’ve been giving some of my favorite recipes the Instant Pot treatment. 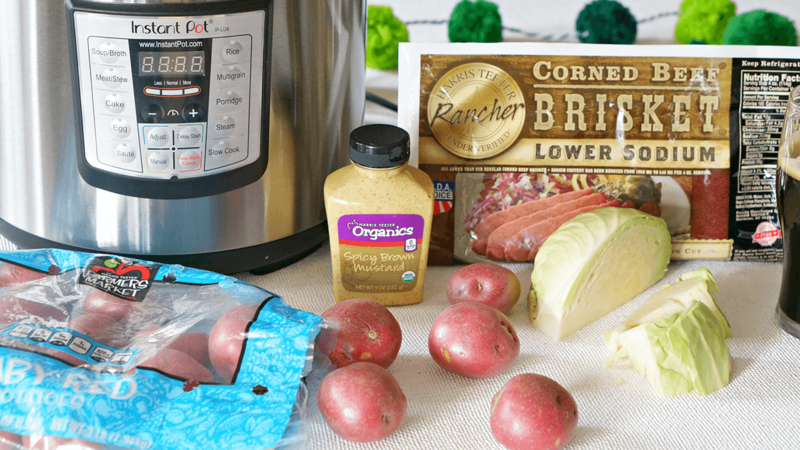 Dinner is now faster and easier… and if you haven’t ever made corned beef at home before? Just wait. Your kitchen will smell amazing. No Instant Pot? No worries. This recipe can also be easily made in the slow cooker; it just takes a few more hours. But whichever way you cook it…. Don’t skip the glaze at the end. It gives the corned beef the perfect golden crust that makes this dish crave-able. And, maybe even worth of making outside of the month of March! Combine sauce ingredients in a small sauce pan. Bring to a simmer over medium heat and stir until butter is melted and the sauce is smooth about two minutes. Set aside. 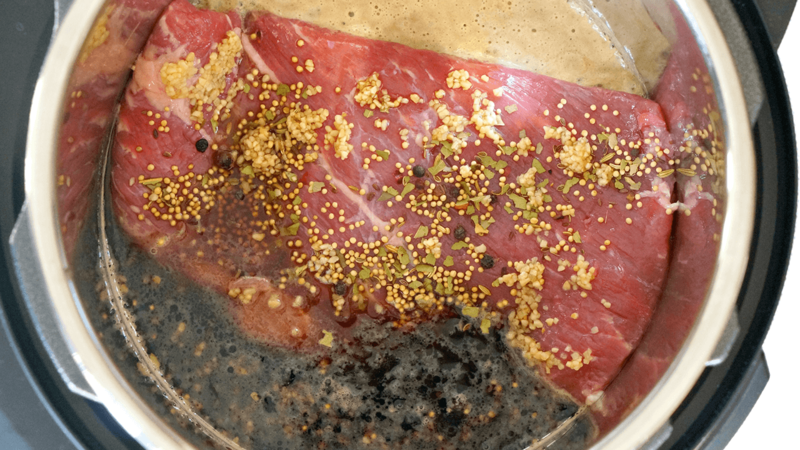 Place trimmed corned beef in the bowl of the Instant Pot. Sprinkle on the reserved spices and garlic, then pour in the beer and stock. Set the timer for 55 minutes. Once cooked and the timer goes off, allow the pressure to release naturally for 15 minutes before releasing the pressure valve and removing the lid. Remove the corned beef to a baking sheet lined with foil and preheat your broiler to low. Keep the cooking liquid in the pot. Add the potatoes, carrots and cabbage to the pot and set the timer for three minutes. Once cooked, carefully release the pressure manually. With a slotted spoon, remove the vegetables to a serving platter. While the vegetables are cooking, brush the corned beef with the sauce and place under the broiler. Continue to baste, every five minutes, for a total of 15 minutes. Remove the beef from the oven to a rimmed cutting board. Be sure to slice against the grain for the most tender bite. Add to the platter of vegetables and serve with remaining honey mustard sauce. Slow cooker directions: Place potatoes in the bottom of the slow cooker, top with corned beef, spices, garlic, beer and stock. Cook for 7-8 hours on low. Continue to the broiling process with the meat. Meanwhile, bring a stock pot filled with water to a boil. Heavily salt the water and add in the carrots and cabbage. Boil for 8 minutes, or until carrots are fork tender. Drain and serve with potatoes, beef and boiled carrots and cabbage.